CSI will be closed for voice communication on Thursday, November 22nd for the Thanksgiving holiday. US exchanges will be closed, but data from other exchanges will be available as usual. The CSI staff wishes you a Happy Thanksgiving! Good timing is the key to success in commodity or stock transactions, and Unfair AdvantageT (UA) offers several tools to aid in determining the right time and direction for your trades. Among the most important is CSI's exclusive Seasonal Index study. As the name implies, the Seasonal Index study measures and reports seasonal tendencies for each market. These tendencies have an immense impact on market prices, yet they are often underestimated or ignored. The Seasonal Index study is a quick and easy way to gauge seasonal behavior for any given stock or futures market. With a finely tuned index reading for each of the 251 trading days per year, CSI's Seasonal Index illuminates the seasonal tendencies for each individual commodity or stock as no other tool can. Traditional attempts at preparing seasonal indices are contrived by tracking average price behavior in a monthly frequency. Most seasonal studies use the average price for each month over all years of history, creating a very coarse monthly average that stands alone as a measure of seasonal tendencies. Conversely, CSI's carefully designed cumulative index incorporates all of the historical data for a given market into a daily time series that can be used to precisely gauge seasonal tendency on a daily basis. UA's seasonal study is perhaps 21 times more refined than the rather crude monthly data approach adopted by other seasonal analysis techniques. The operative term above is "cumulative." The cumulative effect is that for each new day of data introduced after the first full year, the seasonal study gains accuracy and definition. The inclusion of successive days adds more confidence for each precise relative data point in time. As can be seen from careful examination of a series like CSI's #89, Heating Oil (see Figure 1), or a stock (see Figure 2) the cumulative Seasonal Index paints an ever more refined index as more and more data are introduced. Oftentimes, that index becomes predictive of the given market as a whole. The seasonal index's wave form for the forthcoming one-year period is the same wave form painted over the most recent 251-day trading period. We could have overlayed the final year's seasonal waveform repetitively over all years of any series instead of presenting the day-by-day cumulative result, but this, of course, would have been misleading. The final year's seasonal waveform is uniformly derived from all of the data that precedes it." The nearest-future chart of Heating Oil shows seasonal activity that tends to suggest long positions near the end of the first quarter and short positions near the end of the third quarter. 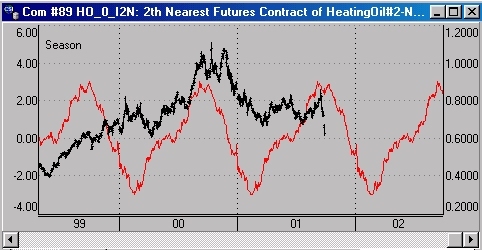 It appears that Heating Oil does demonstrate some seasonal tendencies. These are generally attributed to demand changes due to weather. The computational algorithm for UA's Seasonal Index employs statistics to calculate the chart readings that are defined in relative standard deviation units, not absolute price changes. The index represents a + or - 3 sigma confidence interval over time. Some Seasonal Index studies look like mirror images of the recent past, while others reflect only subtle seasonal effects. 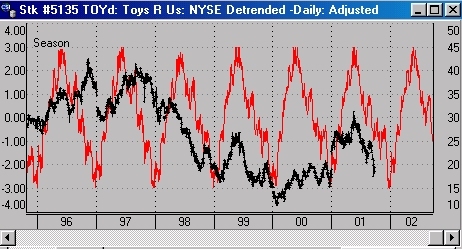 Figure 3 - A seasonal study of ToysRUs stock. Seasonal Indices offer a way to combine seasonal information on market data with daily chart analysis to promote a better understanding of future price movement. The seasonal wave can be used as an input to forecast future events or to simulate past events without bias where any then-current reading does not and cannot affect earlier seasonal patterns. One way to use the Seasonal Index study is to look for coincident peaks and troughs between the market and the index. When peaks coincide or when troughs coincide, the risk of loss on a trading position should be at its minimum. For some traders this may translate into an opportunity to take a heavier position. It is not recommended that seasonal indices be used as the sole basis for trading. They should only be used in conjunction with other confirming market factors. 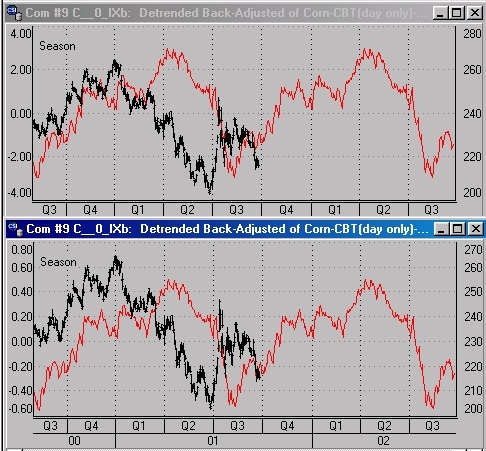 To add the Seasonal Index to a given commodity chart, first make a computed, continuous chart of the underlying market. A back-adjusted or nearest-future series is recommended. Next click the "Change Indicator on Chart" button on the toolbar. Click the "Set Study" button and then click the arrow to display the drop-down study menu. Select "Seasonal Index" and then [OK]. Results may be improved by selecting Unfair Advantage's "detrend" option in creating the input continuous series. This will remove any directional bias that may be present in the market to be studied. Your computed contract must not contain any negative values. We recommend this study be performed on at least ten years of daily data (much more if possible). When years of substantial history are supplied, the cumulative general waveform becomes more and more characteristic of the given market. You should not attempt a Seasonal Index calculation with any time series holding less than one year of data. This back-adjusted, detrended Corn data with CSI's Seasonal Index study reaches the full range of from -3 to +3 sigma in the amplified study. The non-amplified standard Seasonal Index study uses the more modest scale at left. Note that the wave form extends one year beyond the present date. The Seasonal Index study supplies a logical methodology to graphically reveal seasonal tendencies. Seasonal effects might reflect the ebb and flow of the growing season or cycles of demand based on temperature shifts that go hand in hand with the changing seasons. In some cases, seasonal effects reflect demand based upon cultural practices like holiday gift-giving and summer travel. Trading decisions based on seasonality rely on the assumption that seasonal influences do, in fact, affect market prices in predictable ways. Although the Seasonal Index can be appropriately used in testing stocks for seasonal effects, it should not be used to look for clues to behavior of stocks that are clearly not affected by seasonal fundamentals. When no seasonal correlation exists, you will not be able to find a correspondence between the Seasonal Index and the market data. In these cases, the study will simply reflect upon the apparent noisy characteristics of the data. Seasonal regularities in the underlying fundamentals are only one factor in determining price, and seasonal trading should only be used to detect seasonal tendencies if consistently applied over many years. In these times when enthusiasm for the stock market has dampened, it may be a good time to explore traditional commodity markets and highly seasonal stocks. These tend to retain their ability to reward the savvy investor in good times and bad. The examples shown were casually chosen from the thousands of markets in UA's inventory. Seasonal Indices derived from seasonal crops are probably the best candidates to exhibit reliable seasonal patterns. This study thrives on abundant historical reserves, bringing to mind Patrick Henry's famous quotation, "I know of no way of judging the future, but by the past." We wish you the best of luck with trading. The information provided here is general and impersonal in nature, and is not intended as trading advice. Readers are urged to exercise their own judgment and to consult professionals familiar with your own situation before investing. Commodity markets are inherently risky, and only risk capital should be used. Past performance does not guarantee future results.